Feyenoord's sporting director Leo Beenhakker has reacted angrily after Chelsea lured highly-rated teenager Nathan Ake to Stamford Bridge. The Double winners have agreed a deal, understood to be in the region of £230,000, with the Dutch club to sign the 15-year-old defender. They have pipped a host of European clubs - including Manchester City - to snap up Ake, who is set to sign professional terms on his 16th birthday in February. 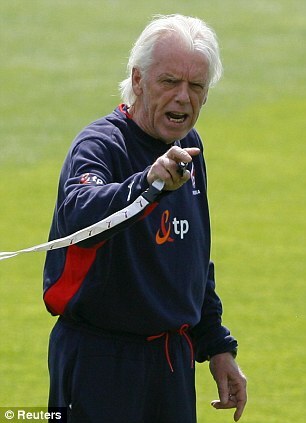 Beenhakker is furious after seeing one of his club's brightest talents slip through the net. The former Real Madrid and Holland boss accused English clubs of arrogance, adding: 'It's driving me crazy that hot prospects are walking away from us like this. 'The Premier League clubs spoil the market with their behaviour. Other clubs in Europe don't behave like this but the English sides just don't care. Ake will join a list of young foreign players at Chelsea who have been signed thanks to the club's European scouting network. They include Patrick van Aanholt, Jeffrey Bruma, Fabio Borini, Jacopo Sala and Gael Kakuta, who signed a new four-and-a-half year deal but could go out on loan next month to gain experience. Their swoop for Kakuta from Lens in 2007 ended in a transfer ban after the French club accused Chelsea of 'tapping-up', although the sanction was overturned. Chelsea were quick to deny any suggestion of an illegal approach for Ake, insisting the move was completed through the official channels. Having been at the centre of controversy with the Kakuta scandal last year, Chelsea are understood to have made their approach for Ake as above board as possible, making regular contact with Beenhakker to ensure they were not accused of any wrong doing. Nicolas Anelka will consider walking out of Chelsea on a lucrative free transfer and joining the exodus to the United States at the end of his contract. Anelka will be 33 when his current deal expires at the end of next season and is interested in the idea of following David Beckham, Freddie Ljungberg and Thierry Henry to the MLS.